2.Roll motor and foil motor can be adjusted depends on neccesity so that two motors can be worked in the same step in order to foil paper transfer to a position smoothly;it would not cause break or shrink of foil. 3.The machine installed with electric eye detecting device. 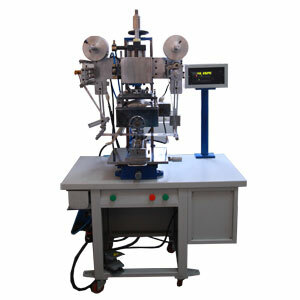 When electric eye makes transfer printing, it can be aimed at electric eye position so that the position of figure of processing articles is at the same position after transfer printing. 4.When it uses general hot stamping foil for transfer printing, it can be set up the number of second depends on necessity for overall circumference surface transfer printing. 5.The external shape of the machine adopts a space saving and full funtion design, so operators are easy to understand and can operate it conveniently.